1 What are Competency Based Interviews? 2 Why do interviewers use this type of question? 5 What are the Competencies Expected of an New Graduate Physiotherapist? Competency based questions or competency questions are interview questions that require candidates to provide real life examples as the basis of their answers. Candidates should not talk in broad terms, be too general or use their imagination when replying to interviewers. Instead, candidates should use specific situations from their life as examples, such as placement, college projects, activities, team participation, hobbies, volunteering and work experience when answering this type of interview question. Candidates should explain why they made certain decisions, how they implemented these decisions and why certain outcomes took place. Why do interviewers use this type of question? Recruitment professionals believe that the best way to find out about a physiotherapist's potential future performance is to find out about examples of past performance. However graduate physiotherapists don't usually have much post grad physiotherapy experience and consequently it can de difficult for interviewers to discuss previous roles and positions held. Instead interviewers use competency questions to force candidates to reveal how they have performed in various situations in the past, revealing individual personality traits. These are a great tool for physiotherapy interviewers interested in finding out exactly who a candidate is and how they may act if employed. Competency based interview questions are slightly different to the style you may be used to. Questions will be structured to explore your past behaviours and experiences, i.e. C - Circumstances: Describe the situation or circumstances surrounding the event. Keep this brief and relevant. B - Behaviour: Describe the specific actions you undertook to overcome the issue or problem. I - Impact: Highlight the outcomes achieved and/or impact made as a result of your actions. Take the time to consider your answers. Ask yourself whether you are using the best example to illustrate the attribute the interviewer is interested in. Your answer should focus on your behaviour and actions. Briefly inform the interviewer(s) of the impact of your actions, focusing on your areas of involvement. Show reflective capacity by analysis of performance remembering to bring out your strengths as well as the areas for improvement. What you are seeking to demonstrate is a strong attachment to learning and development and the principles of continuous improvement. Avoid talking about ‘we’, i.e. ‘we did this’ ‘we arranged that’ etc. Remember that the interviewer wants to know about you. Talk about what you did by clarifying the role that you played in the situation. 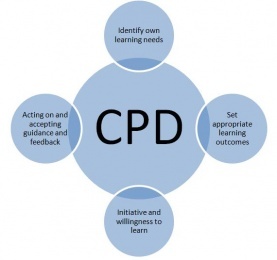 What are the Competencies Expected of an New Graduate Physiotherapist? 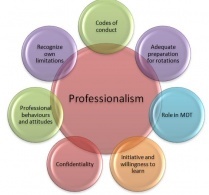 Professionalism involves being familiar with and abiding by codes of conduct, standards of practice and professional and organisational policies as well as legal and ethical standards such as confidentiality. We must also recognize the role of physiotherapists in the multi-disciplinary team and demonstrate appropriate professional behaviours and attitudes. As new graduates, it is vital for us to realize our own limitations and seek help from senior grade staff when appropriate. As we progress into the working world, we need to be aware that our learning does not stop at undergraduate level and we must continue to show a keen willingness to learn and adequate preparation for rotations. Communication must always be professional and proficient with various groups of people. Communication with the patient and family/carer is vital and should always be easily and correctly interpreted by this group. Effective communication with colleagues within and outside the physiotherapy team is crucial for the optimal care of patients and effective management of the multi-disciplinary team. Written communication should always be legible, clear, structured and free from unnecessary jargon. Presentation skills are important for staff in-services etc. therefore these skills must be perfected. 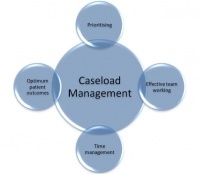 Prioritising and managing caseload should be carried out in response to the needs of the department. Effective team working ensures optimal care of patients. Time management is a competency expected of new graduates in order to provide proficient services. preparation and background knowledge will help us gain accurate assessment outcomes. Throughout the examination, effective, safe handling is expected of us while also ensuring the comfort and dignity of the patient. We should make us of clinical reasoning skills and tools to evaluate findings and develop a problem list, treatment plan and goals. Our treatment sessions should be guided by realistic patient-specific goals and evidence-based practice. Treatment sessions should be carried out within a reasonable time frame and should involve sufficient patient education. Appropriate manual handling skills and safety should be ensured throughout. 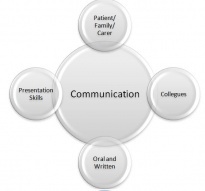 The end of patient care episode should be managed well using effective communication and organisational skills. An appreciation of the holistic approach to patient treatment and management should be adopted. 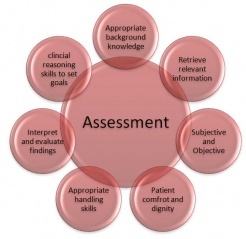 Assessment findings should be documented with evidence of clinical reasoning. Clear, concise legible notes with appropriate use of abbreviations are expected. 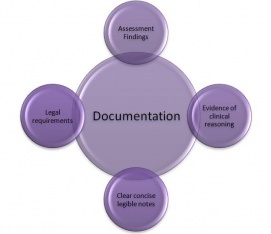 Always adhere to legal requirements regarding documentation. As evidence-based clinicians, it is our duty to always keep up to date with current research. We should use our skills of critical analysis to evaluate current research and apply it to our practice. Evidence based outcome measures should routinely be used to monitor and evaluate treatment and modify if indicated. We must take responsibility to identify our own learning needs and set appropriate learning outcomes. In order to progress our learning, we must act on and accept guidance and feedback. We must recognise the need for the provision of continuous training within the department and multi-disciplinary team. As new graduates, we should actively take part in planning, delivering and evaluating training events as this provides us with further opportunity to learn and develop. ↑ 1.0 1.1 1.2 Wikijob. Competency Based Questions. Accessed at https://www.wikijob.co.uk/content/interview-advice/interview-questions/competency-based-questions on 3 May 2018.